Tucked away deep inside a lush green forested canyon and perched high up on a cliff in Los Padres National Forest is a hot tub built for five. 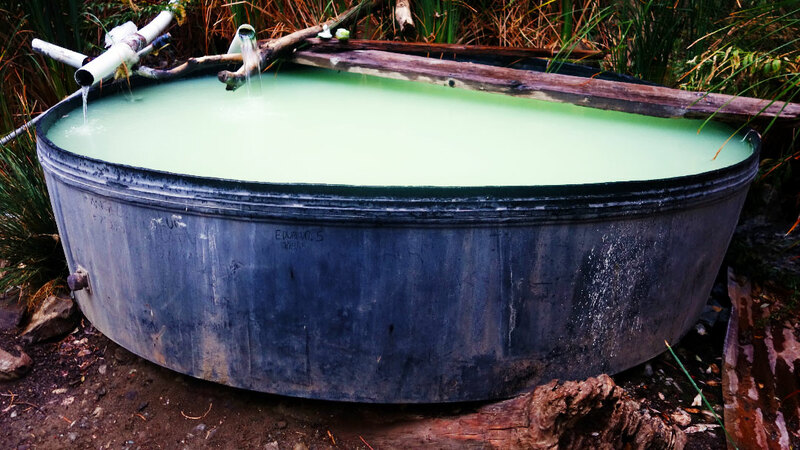 Assembled and still maintained by some incredibly resourceful, and apparently anonymous folks, the Willet Hot Springs hot tub is a rewarding experience at the end of a long hike. 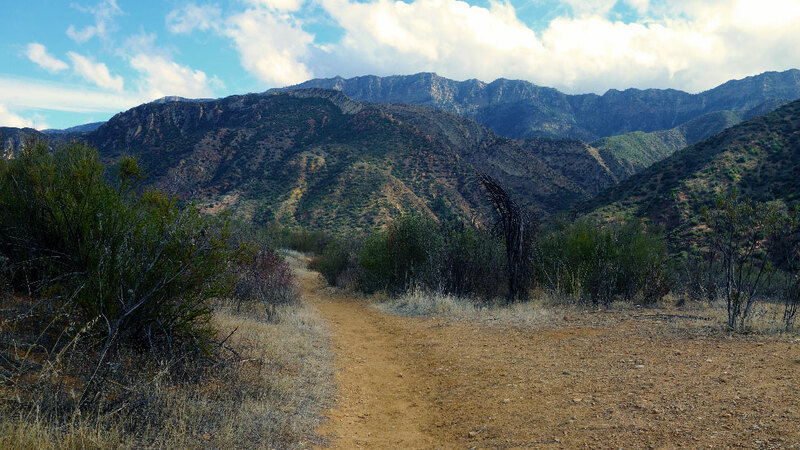 The hike to Willet Hot Springs begins at the Piedra Blanca trailhead in Ojai, Ca. Mileage estimates for the hike range anywhere from 9 to 11 miles, so for the sake of argument I’ll call it an even 10 miles. Despite the mileage, the hike is relatively easy, which means you’ll have plenty of opportunity to take in the remarkable views from the trail. 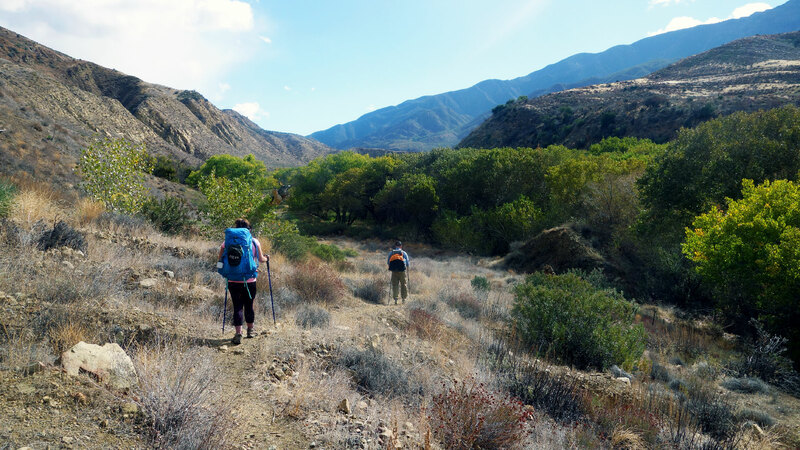 Within a few steps after setting foot on Sespe River Trail, you will make your first creek crossing. We made the journey in early November after a long, dry summer when the creek was dry and easy to cross without getting so much as a toe wet. If you visit during the spring when the water is flowing, be ready to get wet. You will have to cross the creek several times before arriving at the hot springs. 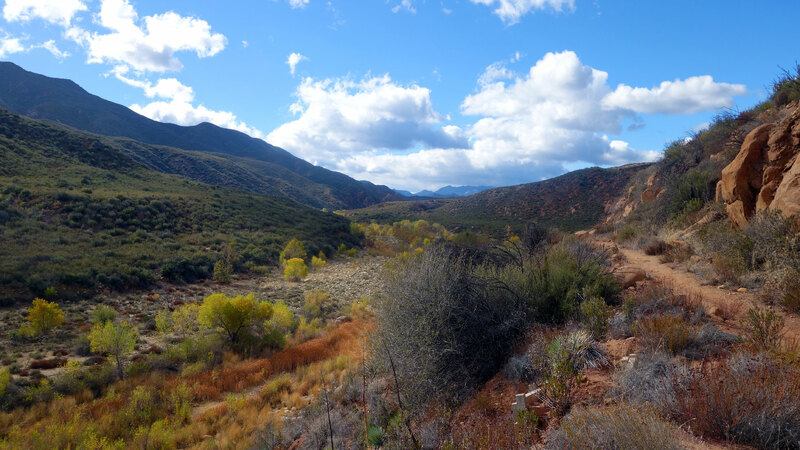 Sespe River Trail continues along the edge of the creek all the way to Willet Camp where, with a little diligence and effort, you will find the warm waters of the Willet Springs hot tub. The hike stays pretty flat the entire way, with only a few brief climbs and a total elevation gain of around 1800’ (based on my RunKeeper stats). It’s well travelled and, for the most part, very easy to follow. Note: I’ve read that the real elevation gain is around 500’. I have a very hard time believing this, not only because RunKeeper registered 1781’, but because there are a lot more hills than I expected. Still, it’s not a tough hike. Just be ready for it not to be dead easy either. While you travel, you’ll be treated with endless views of the surrounding valleys and rugged canyon walls that at times reminded me of the Grand Canyon. The sweet smell of sage is everywhere. California buckwheat dots the trail and hillsides with reddish-brown and white blooms, while wild desert flowers and dense chaparral contrast against the backdrop of manzanita and yucca trees. Along the creek cattails, willows, cottonwood and sycamore trees grow in abundance. 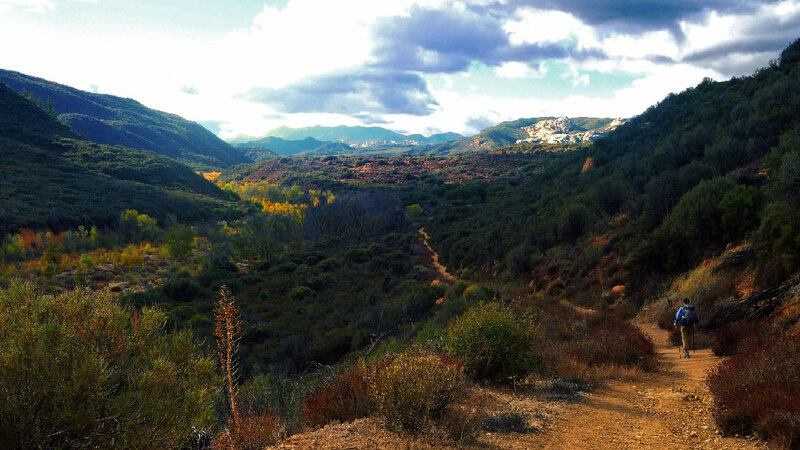 During the fall, autumn colors are in full swing near Sespe Creek as green leaves turn to beautiful hues of bright yellow and burnt orange in preparation for winter. Established and improvised campsites are in just about any scenic place you can imagine. Most of them sit near the creek, while a few campsites are higher up on the hill along the trail, and nearly all of them have a fire ring of some sort. Tip: Look for higher ground. 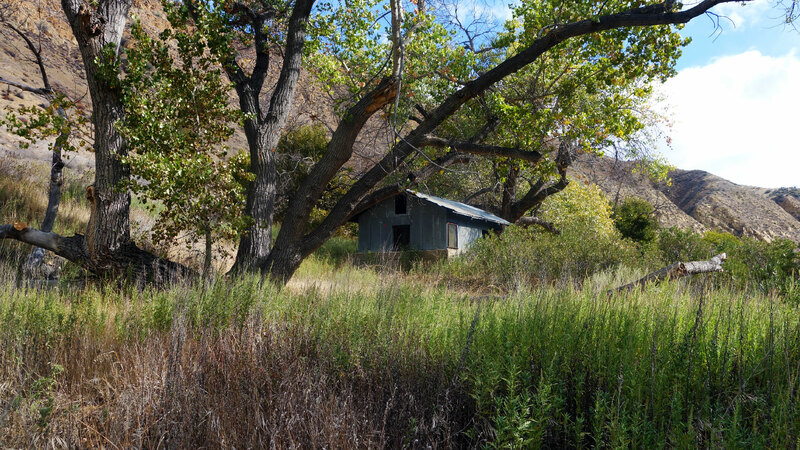 Camping in or near the dry creek bed sounds appealing, but wiser campers know that’s the best way to get caught in a flash flood. Bear Campground, about one-third of the way in, is the only water source we found between the trailhead and Willet Camp. The campground has a spring fed pool that has running water year around. It was a little cold when we visited, but on a hot day the cool waters would make the perfect spot for a refreshing dip. It’s also a nice spot to stop for lunch or a snack while relaxing by the pool. Check the trail map at the end of this article for details on how to find Bear Campground. You’ll know you’re near Willet Camp when the trail descends down into a valley with densely forested hills surrounding you on all sides. At this point, the creek widens and curves around to the right. Near the far left corner of the creek is a steep canyon that pulls back into the hillside. This is where Willet Hot Springs meets Sespe Creek. At the base of the valley, before the creek turns right is Thatcher Campground. Look for a connecting trail that heads off to the right just before the campground. If you reach the campground, you’ve probably gone too far. Take the connecting trail to the right and cross the creek one more time where you will find another trail that will take you around the east edge of the creek. Follow the trail for a couple hundred yards around to the east until you spot another connecting trail to the left leading to the creek. Tip: Depending on the time of year, finding a spot to cross the creek one last time may or may not be easy. We spent about an hour and a half wandering around in the rain before we were able to find a good spot to cross, in part because we weren’t actually sure we needed to. The good news is, we found a spot to cross and were pleasantly surprised to discover that it was the right choice. Cross the creek one last time and head towards the grassy meadow at the base of the valley where you’ll find the famed Willet Camp. 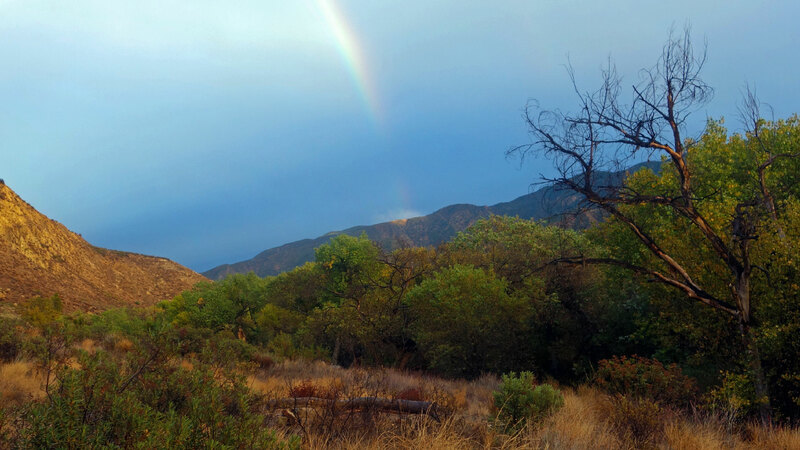 We knew we had found our destination when, upon our arrival, we saw the end of the rainbow. 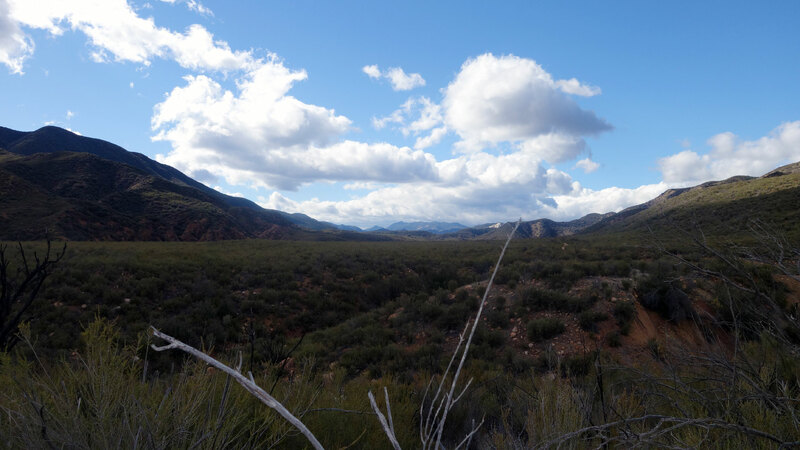 The short story of Willet Camp is that until a flood washed out the roads during the 70s, 4×4 vehicles could drive all the way to this site and on to Sespe Hot Springs. After the floods, the camp was only accessible on foot. 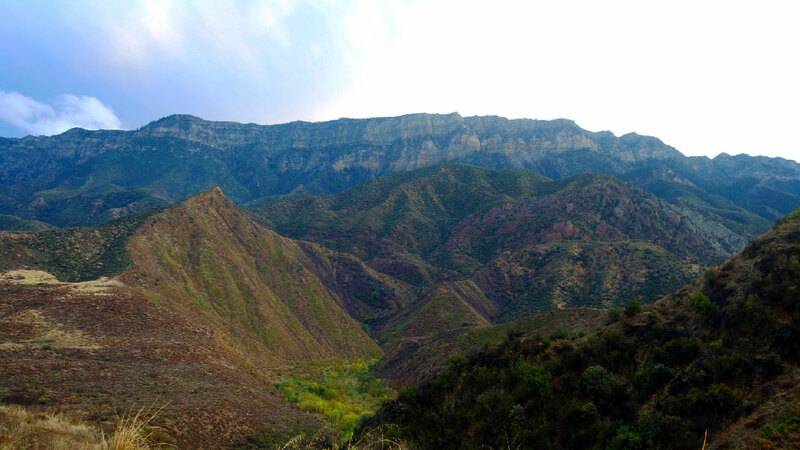 In 1992 the U.S. Congress designated the area as “Sespe Wilderness,” and the rest is history. The long story is long and involves gold mining, oil, floods, California Condors, Boy Scouts and more. Read about the history of Willet Camp if you want to get the full story. From the creek, the trail leads up towards a small rustic cabin nestled in among the trees at the bottom of the steep cliffs. As you walk towards the cabin, you will come to a point where the trail forks in two. The trail to the right leads to the cabin, while the trail to the left leads to Willet Hot Springs and the refreshing Willet Hot Springs hot tub experience. Follow the hot tub trail up the hill until it plateaus. 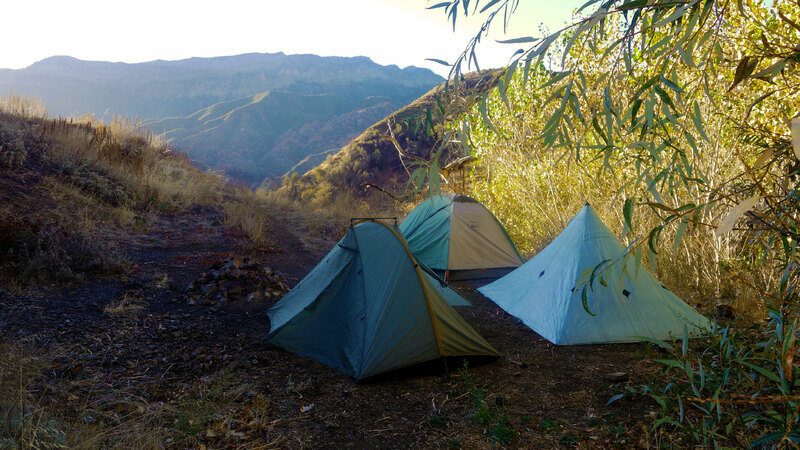 At the top you will find a nice little campsite just outside the forested hill hiding the hot tub with views overlooking the canyon. The campsite was clean and relatively flat with more than enough room to fit our three two-man tents. It also had a rock-based fire ring, which we were unfortunately unable to use due to fire restrictions in place at the time of our visit. From the campsite, set off into the forest and navigate your way up the hill, following the spring until you reach the “just-hot-enough” awesomeness of Willet Hot Springs’ hot tub. Don’t be turned off by the color of the water you see in the picture. It’s full of sediment and minerals from the spring, not to mention the harmless algae. Although it still had a green hue, when we woke up the next morning the water was inviting and crystal clear. If sharing a hot tub with basic lifeforms isn’t on your bucket list, not to worry. Past visitors have kindly left a variety of brushes and scrubbers behind, which are useful for scrubbing algae off the floor and walls of the hot tub. It’s said that you can scrub, then drain the tub and refill it to remove the slimy scum. We opted for jumping right in, slime and all, though I did choose to wear my hiking shoes, since they were already wet from hiking in the rain, to keep my feet scum free. This story wouldn’t be complete, nor the journey possible, had it not been for my fellow trekkers on this hike, Doris and Don. This was my first trip with Doris and my fourth with Don. Don and I hit both the Lost Coast Trail and San Jacinto Peak in June this year, and Yosemite in June of last year. He’s planned our three most recent outings and they’ve all gone off with out a hitch. Don’s been working steadfastly on lightening his load, just like me but with a lot more success, so that he can pack more mileage into a shorter time period. I think his base weight for this overnight trip was down to around 9 lbs. That’s a solid 5 lbs lighter than my 14 lb base weight. Doris has been hitting the trails hard this year as well. She and a friend of hers recently summitted both Mt. Baldy and Mt. Whitney, among other various outdoor adventures. She’s an avid hiker and backpacker, not to mention an entertaining story teller. Be sure to check out her blog to get her take on our epic journey. Follow Doris on her blog and Instagram. 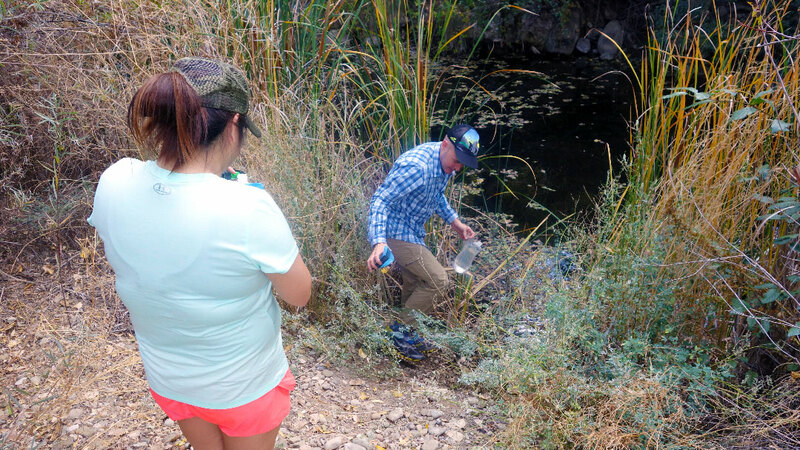 Water sources are scarce when the creek is dry, so bring plenty of water. Watch for cairns and other trail markers to help you find your way across the creek. The trail is largely exposed, so use caution if hiking when it’s hot. Get an Adventure Pass to avoid being ticketed or having your car towed. Bring a swimsuit for swimming and hot tubbing. Bring water shoes for creek crossing so you don’t get your hiking shoes wet. Bear canisters and bags are not required, but bears are out there so plan accordingly. Great post! 🙂 What did you use for filtering your water? Thanks, Mailoha! I use and highly recommend the Sawyer Mini water filter (https://sawyer.com/products/sawyer-mini-filter/). Very lightweight and easy to use if it’s just for yourself.